Career Consultant. It was a profession where they perform various consultations for a person in hope of getting a job. Per the changes the author made, I’m following his direction of merging chapters. A story about a dude with a former job on helping people getting a job. Was he teleported to two different worlds? And what is he doing in the final world, convincing people to become slaves? This sounds pretty interesting. Looking forward to more chapters! Thanks for translating!! 1% chance.. worths the post. Thank you 🙂 this looks like it has potential. preetty interesting. I love management kind of storyline. I feel this premise is kinda off somehow? 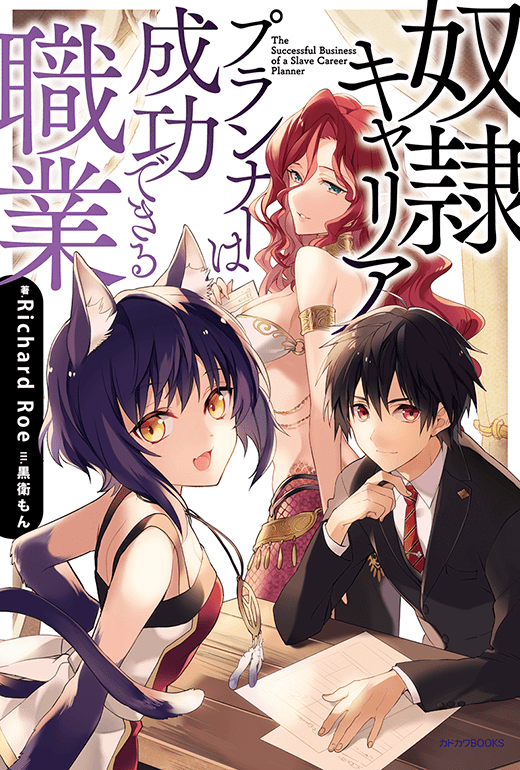 The Japanese web (and light novel) authors seem to have a dubious interest and obsession in slavery…it’s in so many of these web novels as a matter of course and the protagonists often just seem to accept this without much resistance? Considering the reality of slavery is brutal, inhumane and already frighteningly shown by terrorist groups like ISIS – Then I wish web authors wouldn’t keep using it as harem titillation etc. It’s because their concept of slavery in their novels are totally different from what is usually known IRL. From the novels I’ve read, the slaves are treated more like vassals. The setting of slavery is (usually) used to quickly show the moral superiority of the protagonists over the other stereotypical slave owners there. But you are right, its a serious issue that shouldn’t be cheaply used as a plot device. Nodesu. From my understanding of Japanese culture, they equate slavery to indebted servitude. Their idea of slavery is more commercial, as long as you can pay off what they paid or what you owe, then you are free. Just look at the geishas during the warring states period, most of them are sold by their parents and as long as they can pay off or someone pay them off for their worth, then they are free. Yay, more about slaves. A lot of MCs save slaves, but very few become slaves and this is the first who I see dealing in slaves. The two later I find really interesting if the slave system and and you have the POV from the slave, slave maker and custumer/bystander about the same event. No idea whether you’d like it, but “Rise of the Shield Hero” is a pretty good story with slavery in my opinion. Is this still getting translated? Is this still being translated, is this like a one update every 2 weeks, at least? Heh, nah. I thought it would be on a regular basis but it hasn’t been updated for months now. Yeah, I really enjoyed reading this but seems like no one is updating it. sorry about that, im just a lone translator. It would be updated frequently if there was somebody to help me. Well, no need to apologize as we’re not doing anything that’s helpful. (or are even able to) This novel is great though, I might check out Otherworld Nation, seeing as you focus more on that one. We all appreciate you taking the time to do this, by the way. Keep up the good work! why did you abandon this serie? i like it very much because this a very unusal serie . can you post at least one more chapter ! what’s the problem here ? are they too few viewers? its not dropped, i was trying to finish the whole chapter 2 of pharmacy before finishing chapter 2 of slave career. But, IRL is holding me hostage right now so I’m slow right now to TL. Ten months since last chapter. Still translating this? Is it dropped? If dropped, has someone else picked it up? Great story and hoping for more. Hopefully translator sama is well. Hello , i have 1 question , does this Novel been dropped ? Was This Dropped? Please Tell Me That Is Not true! It Is Now Aug. 2017 And You Started Back In Sept. 2015. Is this still being translated? It’s been almost a year. If it’s dropped please let me know.